KitchenAid has proven over the years to be a wonderful brand name that is trustworthy and has amazing functionality. Still today, KitchenAid remains among the top brands when it comes to both kitchen appliances and accessories for both home and commercial cooks all over the world. In the home, KitchenAid gives you a reliable way to ensure that you are creating special and delicious food each and every time you serve your friends and family. Here is a list of the 15 most useful KitchenAid accessories for the smart cook - ones that have stood out from the crowd and ones that you will turn to, time and time again. Be sure to check out these new KitchenAid online promos to help you save on your purchase. 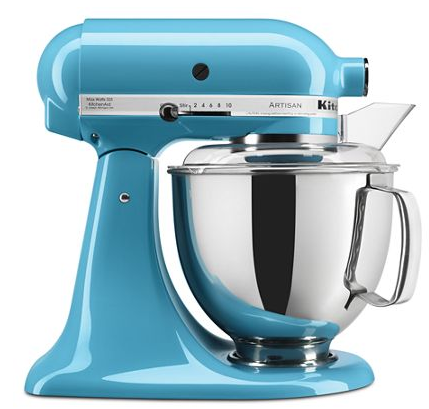 This Artisan Series 5 Quart Tilt-Head Stand Mixer from KitchenAid remains one of the company's top selling items, and with good reason: it is perfect for home cooks who spend a lot of time mixing dough for baking projects, shredding foods, and a wide assortment of other kitchen tasks. If you boil water for a lot of things, such as tea or coffee, using an electric kettle can help shorten the amount of time you need to wait for your water to boil. Simple controls, as well as a stylish design, make this KitchenAid electric kettle popular. 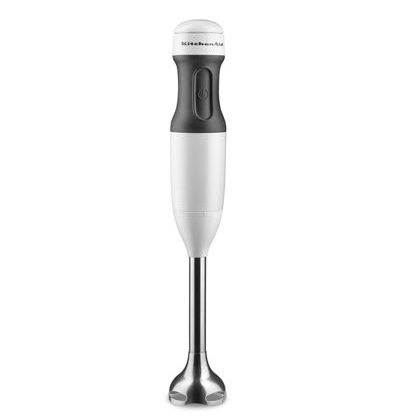 If you make a lot of soups, sauces, and dessert fillings that require a blender, you might fall in love with a hand blender. Simply use the hand blender in the pot or dish you want to blend the food in - no need to transfer to a traditional blender. Bamboo is known for its antimicrobial properties, as well as its durability in the kitchen. A bamboo cutting board from KitchenAid, especially one that gives you both sides to use and has a beveled design to prevent spills, definitely deserves a place in every cook's kitchen. Ceramic bakeware can hold up to even the toughest of culinary creations - most times it is safe to high oven temperatures, as well as dishwasher and freezer safe. Since ceramic is nonporous, is does not absorb bacteria or odors from cooking or food. When it comes to bakeware sets, you want to be sure you have the basics covered. This basic nonstick bakeware set features a muffin tin, sheet pan, and loaf pan, along with other items. Never underestimate what you can do with a good stockpot! 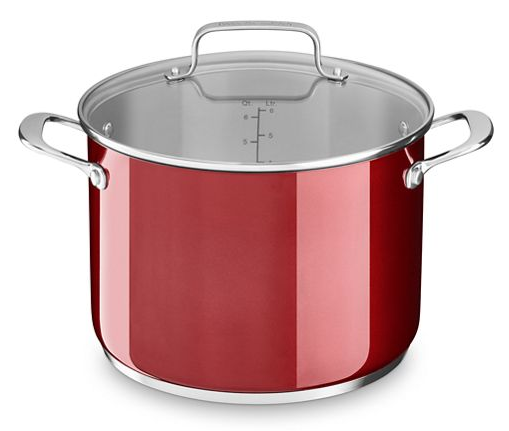 From boiling pasta to cooking soups and stews, a good quality, stainless steel stockpot will last you a long time. This KitchenAid stockpot has measurements inside so you can see how much is in the pot. From sizzling steaks to scrumptious sandwiches, this grill pan and panini press from KitchenAid online can do pretty much everything. The square shape gives you extra room to cook, while the press is great for searing food on both sides. A stainless steel roaster is the type of roasting pan that you can expect to have for years to come. This pan is large enough for a turkey, yet can be used for smaller recipes, such as a lasagna, as well. This Hard Anodized Non-Stick 11-Piece Set from KitchenAid gives you all the essentials that you need for creating a wide variety of dishes. The eleven piece set is perfect for those new to cooking or those looking to replace basics. If you are into grinding your own spices, this coffee and spice grinder is the perfect way to do so. It includes 2 stainless steel bowls and a sprinkling lid! 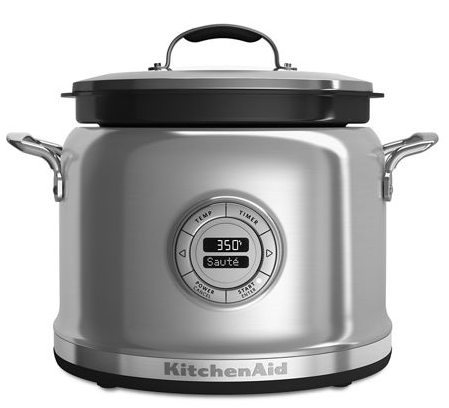 Simmer, slow cook, sauté, and more with this ten function multi cooker from KitchenAid! This appliance is perfect for the way you cook is great for small and large crowds alike. Everyone who is a home cook needs a decent cutlery set, and KitchenAid has several that fit the bill. This 16 piece cutlery set features a triple rivet design and a knife block organizer to keep them all in sharp shape. If you love the taste of freshly ground coffee and would love to do it on your own, this Burr Grinder from KitchenAid is a great way to get that fresh taste. The grinder features 15 grind levels to help you get that perfect taste and texture, each and every time. Those who love to cook and bake will appreciate a simple, easy to use hand mixer. 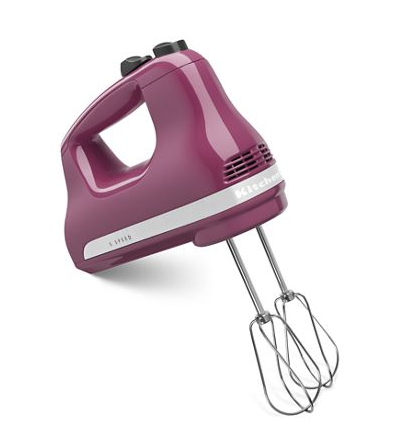 This hand mixer features five speeds that will be perfect for all your culinary creations, and comes in several beautiful colors to match any kitchen decor. There are plenty of KitchenAid accessories available for home cooks and bakers. Many of them are available in a wide assortment of colors to match your kitchen decor. From small appliances to bakeware and cookware, you can be sure there is something that you can use on the list above!